Dec 4th: This is more of a short essay than a blog, and more of a reflection of my time and experience of a country born from turmoil and colonialisation. On reaching South Africa there is one subject you cannot avoid and are drawn into learning about, that is Apartheid. A theme that is inextricably linked with Apartheid is the life story of Nelson Mandela. As much as South Africa is a fantastic country with a beautiful and varied backdrop and amazing people it still has the workings of a country divided in a common democracy. As soon as you enter South Africa there is a noted change between how the ex-white ruled colonies of Zimbabwe (Rhodesia) and Namibia are seemingly on the surface at one with their past and open about their current situations with the ruling parties, with South Africa you get a sense there is still not a balance struck between the past and present despite its democratic state and first world status. Here there are still huge divides within the country that can be felt and seen. On of the most interesting facts about South Africa is that it has taken a path of absolute political correctness, which can be seen in different African societies such as Mauritius, but Mauritius never had itself caught up in the questions of race and colonialisation it just became a true melting pot that respected one and all and balanced its 3 old colonial masters with its immigrant population which has built a model of one of the most successful African societies. It’s true that Mauritius was not under a rule of Apartheid and looking at the US back before civil rights it’s visible that changes due to racial divides and oppression take decades, arguably centuries to heal and find balance in the countries society. A South African said to me that the racial divides and the march towards true democracy will not been fulfilled until a truly multi racial party based on politics of the people and for the people come to power in a true democratic fashion. The ANC arguably was the only real sensible option in the 1994 elections for the Anti-Apartheid Majority, despite many parties running in the elections, with Mandela at the helm it was inevitable he would lead them to power. Right now the ANC is under fire and new cases of corruption and abuses of power are coming to light and leading all the way to the top but the African ‘Big Man’ culture seems to be prevalent, only time will tell. But on the trail of Mandela it has been a very interesting journey, inevitably a whole tourist industry has risen along with the post imprisonment journey of this great man, but it is fascinating learning more about this man, about his past and his struggles but also along the way you learn about the unsung heroes or forgotten great men and women of the apartheid era from all races who fought the apartheid regime. 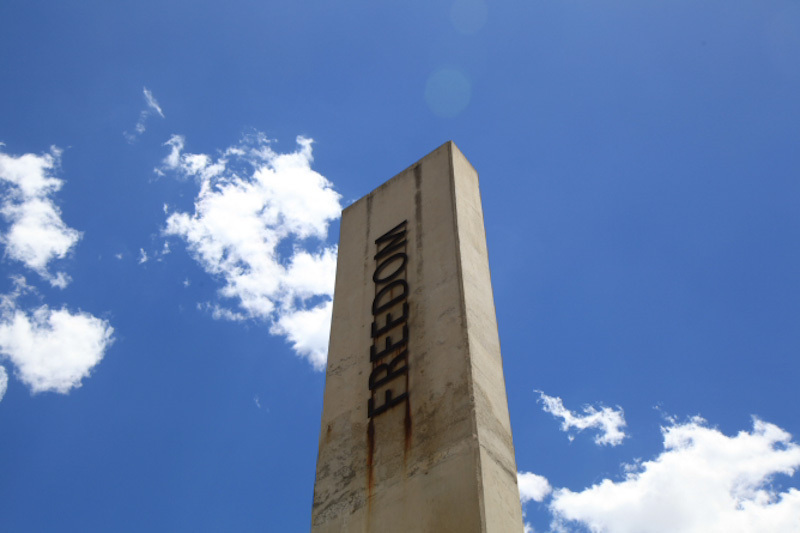 We visited a few of the main landmarks of the Apartheid struggle including in Cape Town, Robben Island and in Johannesburg Soweto Township, Hector Petersen Museum and the Apartheid Museum. All share a common theme of including Mandela as the poster child of the Anti-Apartheid movement but all telling and educating the visitors to the different aspects and viewpoints of Apartheid. All great men and women in history have a legend that follows them and as the legend is told often the truth and facts are embroided to the favour of the legend. What’s fascinating when you follow this trail is the surprising things you find out about Mandela and also how his story is spun from some angles to milk his legend status. For example Mandela in his younger days as part of the ANC military arm MK he was a terrorist. In today’s world you do not use the term lightly but he orchestrated bombs and attacks against infrastructure around South Africa, never human life but still terrorist activities – Can you imagine Gandhi or MLK if this had been in their past? In another aspect we sat and had lunch in Soweto at Mandela’s Family Restaurant, opposite a house that Winnie Mandela had owned on the only street in the world where two Nobel Prize winners had come from (Arch Bishop Desmond Tutu being the other). The restaurant is owned by Winnie but is there really to milk of the legend, selling mugs and all sorts and whilst we were there hosting a small party where the group was busy necking/shooting shots of tequila!! What I have found most fascinating about the trail is the untold or less known stories I discovered, the story of Robert Sobukwe of the Pan African Congress (PAC) who spun off from the ANC, a seemingly great anti-apartheid leader whose struggle followed a similar path to Mandela but sadly died before he saw his country free of Apartheid. Hector Petersen, a child shot during the township uprisings by students became a hero of the movement for change in South Africa. Steve Biko an activist, who was imprisoned, tortured and after some days died at the hands of his captors. Also many young men and women who were part of the uprisings in the late 1980’s and saw the loss of about 14,000 lives. It is truly an honour to follow in the trail of Mandela, a truly remarkable man, to whom I feel greatly privileged to live in his lifetime and who took South Africa to a new place in a peaceful way and went a long way to heal wounds of the past. This is by no means a state of nirvana for the country but it was a leap in the right direction now. It has been fascinating learning more above and beyond Mandela as well both good and bad. As we leave the trail and South Africa, I cannot help but think after much learning and discussion that there is still a long way to go. The tenure of the remaining former inmates of Robben Island in the countries leadership is something that perhaps should no longer be a qualification for power. Maybe the country does political progress to move forward to reflect a balanced democratic society for the people by the people. South Africa is a country of phenomenal people and phenomenal landscapes, I believe it can achieve this balanced status, but only time will tell.